The Lord’s Supper was celebrated throughout congregations in Stornoway last weekend, where church members ate bread and drank wine to proclaim the Lord’s death till he comes. The question is often asked, who should partake of the communion and sit at the Lord’s Table. This question was addressed in the “fencing of the table” in our own congregation by the Minister. It is important to recognise that fencing the table is not merely a man-made tradition, but a Biblical tradition. When Christ first instituted the Lord’s Supper, He Himself fenced the table to distinguish between those who should and should not participate, as well as to encourage believers to recognise the marks of grace in them and participate (Matthew 26:21-25; John 13:10-17). There are two extremes, which we can fall into as churches and individuals. The first is for the church to invite everyone to participate, without warning or encouragement, irrespective of our spiritual state. The second is for believers to hold back from participating due to our battle with sin. 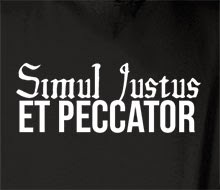 The 16th century reformer, Martin Luther, famously spoke of our justification (God’s accepting us as righteous), through the Latin phrase, “Simul Justus et Peccator,” which translates as, at the same time righteous (or just), and sinners. On the one hand, due to Christ’s righteousness transferred to our account, believers are accounted as righteous in God’s sight. On the other hand, in and of ourselves, we are still sinners. The minister used Luther’s phrase to fence the table, in order to distinguish between those who ought and those who ought not to participate. At the same time, it was an encouragement to those of us who battle with sin, that the Lord’s Table is not for perfect saints, but for those who fall short of His standards, yet wrestle with our sin and desire to be like Christ.